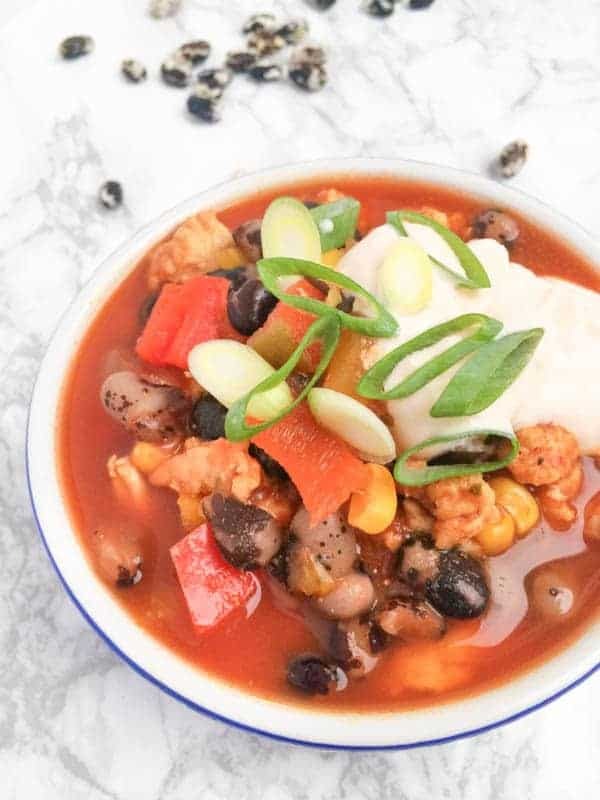 Smoky paprika and chipotle peppers in adobo add flavor and depth to this healthy and satisfying turkey chili. This version is for your stovetop and is ready in less than an hour. Everyone loves Tex-Mex and Mexican food. Beef fajitas, fish tacos, chili….what’s not to love? Right, Rich? What’s not to love? Apparently everything. My infamously picky husband does not like Mexican food. I keep trying to pin-point what it is exactly that he doesn’t like but generally speaking, if it involves cumin, he’s out. 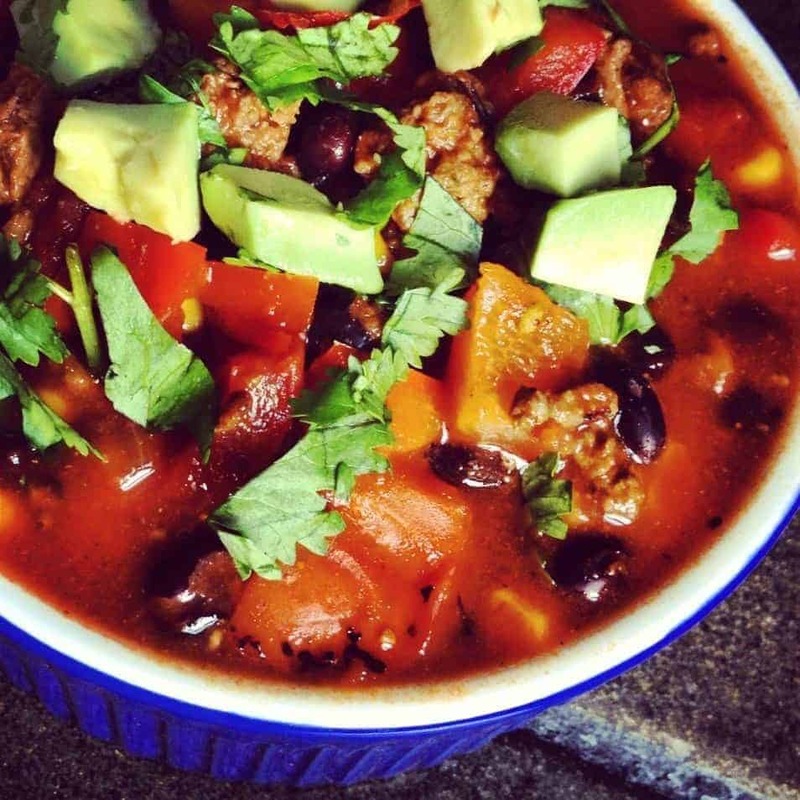 Over the years, I have tweaked various recipes of turkey chili. It is safe to say that no two recipes are the same. The vegetables vary throughout the year depending on availability. This is the perfect recipe for the end of the week to use up leftover veggies in your crisper. (Crisper? Did I just say that?) Sometimes I use black beans, sometimes I use pinto. And when I’m feeling really frisky, I add both. Are you looking for a Slow Cooker Version? 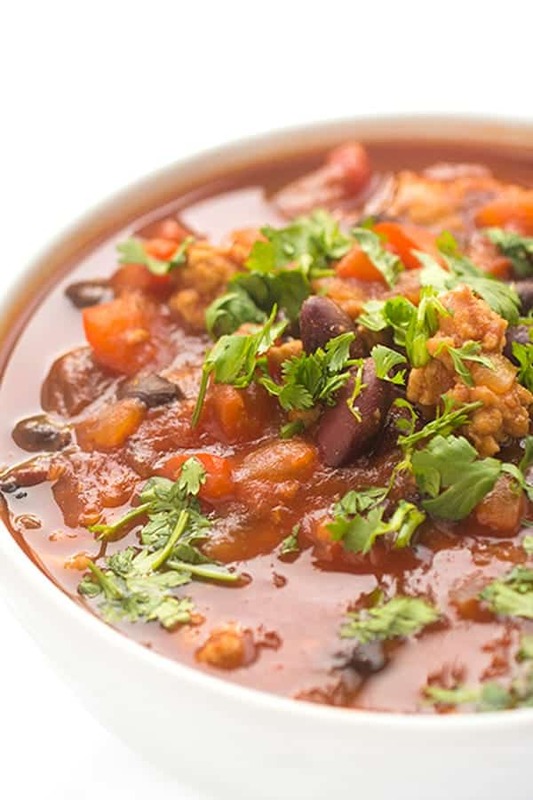 See my Slow Cooker version of turkey chili here. Truth be told – as long as you have the fundamentals, you really can’t go wrong with this one pot wonder. Heat large soup pot over medium high heat and spray with non-stick spray. Add turkey and spices (cumin through grill seasoning and cook for 6-8 minutes or until turkey is browned. Add beer to deglaze the pan and scrape up brown bits on bottom of pan using a wooden spoon. Stir in chicken broth, tomatoes, bbq sauce and bring to a boil. Add rinsed beans and corn. Simmer for 20 minutes or longer and garnish to serve with a dollop of Greek yogurt and chopped fresh cilantro. Tastes even better the next day. Any idea how long the leftover chipotle peppers would last in the fridge? I only ever see recipes needing a tablespoon or so, so there’s always a lot leftover but I hate to throw them out. Actually I freeze mine!! Mince them up then put in a ziploc and just cut off a cube the next time you’re making soup, chili, pasta, roasted veggies, etc! This is probably a silly question. I love this recipe, but how do I make it into a crockpot recipe? Would you just put everything in the crockpot? Not a silly question at all! All you’d need to do is brown the ground turkey in a pan then place in the crock pot with everything else. Enjoy!! Could this be served as an entree with, say, brown rice and a veggie rather than as a soup? If so, I’d really appreciate knowing what if any changes you’d advise! Thanks so much and happy New Year! Absolutely!! Just don’t add the beer and chicken broth and keep everything else the same. Pour it over whole wheat pasta, brown rice, quinoa, sweet potato, you name it! Let me know if that answers your question!! What a versatile recipe, good for a soup or a main course with the changes you helpfully note! I’m looking forward to making it. :-) Thanks, Liz, and happy New Year! Great creative recipe!! I am new to your blog and LOVE your whole healthy doesn’t have to taste healthy approach. I have the same deal on my blog. Great to meet a fellow healthy food blogger! Love the recipes and will definitely be back! How do you get the Nutrition Facts Box on your page? I have been looking for a way to add that to my blog. Thanks in advance! How big are your serving sizes normally? One cup? Cause I noticed that a lot of your recipes say “serving size: 1” but it doesn’t specify exactly how big that it and I like to be precise with my portions. Thanks! Hi Mitchell – The serving size is 16 oz. I have updated the recipe, my apologies for that missing information! Please let me know what other recipes you need it for. :-) I hope you enjoy the chili! I was going to try this but was wondering where the OJ comes into play? I’m assuming it is a substitution for the beer? Is there a big difference in taste either way? 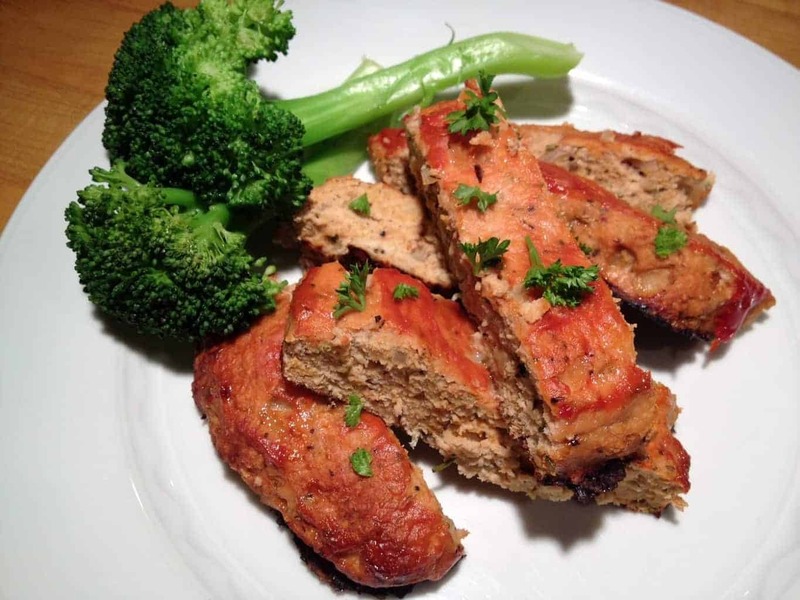 Trying to meal plan for the week and this looks yummy! Hi Jenn – No need to use the orange juice unless you want to use it! And yes, I used it to deglaze the pan when I used the beer. Truthfully, it didn’t make a huge difference in flavor but since it was a secret ingredient for the challenge, I had to use it. :) Let me know what you think and how it turns out!!! I am so glad to hear you liked it!! You can definitely dial down the spice for little ones next time. My 16 month old LOVES chili and in fact we will be having it for lunches this week. :-) Let me know if you try anything else! This is probably a stupid question, but the nutritional information… that's for one serving of this, right? :) I want to make this tonight, but I'm on Weight Watchers, so I'm trying to figure out my points! Yes thay is per serving! Thank you so much for the nice comment!! So glad they enjoyed! This is a fantastic recipe. My family loved it without realizing how healthy it is.